Another quick, easy and yummy recipe! 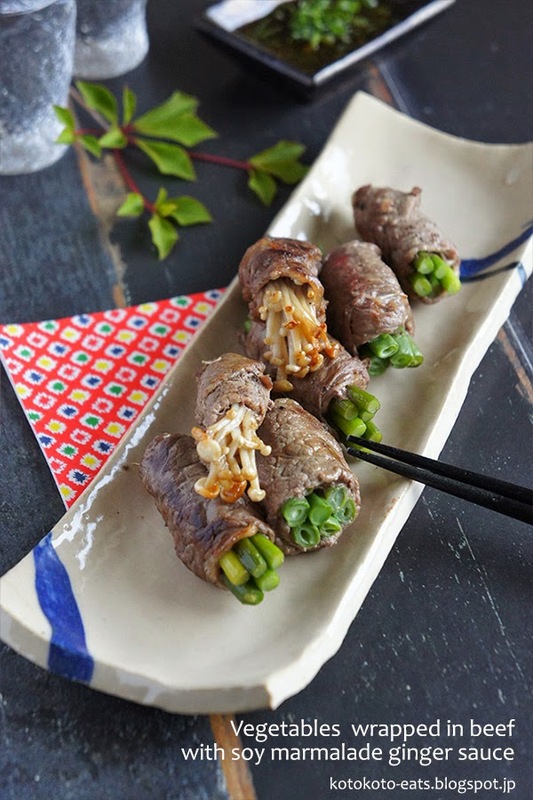 Here I used green beans, enoki mushrooms, and garlic stems, but you can also use other vegetables like asparagus, zucchini, etc, as long as they are easy to be wrapped in thinly sliced beef and do not get watery when they are cooked. Great as nibbles on their own, or it can be served as the main dish with a bowl of rice. These are also suitable for bento box since they stay yummy even when they are no longer warm. - I knew I wanted to use this white, rectangular plate that I made myself for this recipe. Therefore, I chose the dark wood texture for the table to make contrast with the plate. - Since there are lots of greens in the main dish, in the sauce, and the plant used in the prop, I decided to use red paper as an accent. The paper has green and blue dots in it, so it still compliments the greens in the photo, as well as the blue stripe of the plate. - glasses with cold sake in them were used as drinks to give the photo a fresh spring/summer atmosphere, and also to suggest that the main dish goes well with alcohol. 1) Place the thinly sliced beef in a bowl. Mix with sake, salt, and pepper. 2) microwave or steam the garlic stem and green beans til they are slightly tender on the outside ( we will cook them later in a frying pan, so they do not need to be throughly cooked). Cut them so that each piece is about the same width as the thinly sliced beef. 3) Carefully take each piece of beef and spread it flat. Wrap each piece with enoki, green beans, or garlic stem. 4) Combine all the sauce ingredients together in a small bowl and mix well. Place it in a small sauce dish. 5) Put olive oil in a frying pan. Cook 3) at medium heat til the inside of the beef wrap is slightly rare. Place them on a serving plate. If it is hard to find thinly sliced beef in your neighborhood, a beef steak can be placed in a freezer til it is hard enough to slice it with a knife ( almost like sorbet texture).